National Museum of Militairy History -Diekirch- http://www.nat-military-museum.lu/ Text and pictures have been kindly provided by Mr Roland J. Gaul, the curator of the National Museum of Militairy History -Diekirch-, we thank him very much for his contribution. "The National Museum of Military History is now enriched by an original 1944-built German VW-166 "Schwimmwagen" (amphibious staff car), as the worldwide database on remaining VW “Schwimmwagens” on www.vw166.com is enlarged by one unit. It was two years after the official initial opening of the museum in 1986 that a heavily-wrecked (but still recognizable) VW-166 was found in a barn in the Luxembourg Ardennes, long-forgotten for many years. The vehicle had been scrapped, painted red with many graffiti and had apparently served as a funny point of attraction in a 1948-held Carnival parade. Further research revealed that the actual vehicle was abandoned most likely for mechanical breakdown at the outskirts of Diekirch in late January 1945 by the retreating German troops, where a farmer had “salvaged” the vehicle and later on sold it to an individual. Decades later, the museum volunteers acquired the remains of the VW-166 and stored it pending proper restoration and procurement of rarer spare parts. It was thanks to the kind assistance of the German military attaché’s office of the German Embassy in Luxembourg that contact was established by the former SIZ 860 (mechanical repair shop) of the German army in St. Wendel, Germany. This large maintenance unit – now a civilian institution – has an apprentice school for future mechanics and car repair specialists. The management SIZ 860 agreed to put the old warrior up to snuff again and accepted the wrecked vehicle with a batch of newly-made spare parts. 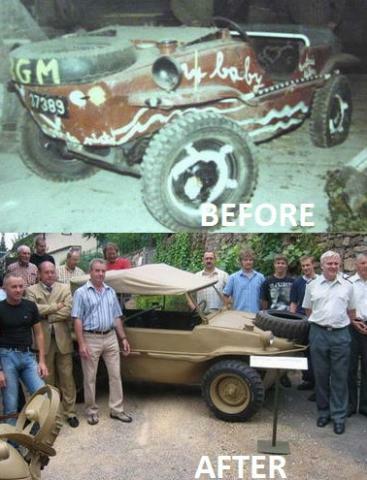 Under the expert guidance and supervision of masters Mr. Bommer, Mr. Mosmann, and Mr. Schneider, some 50 young German trainees worked countless hours during a 3-year period to fix the “Schwimmwagen”. The “wreck” was completely taken apart, sandblasted, primed, and step-by-step reassembled with numerous larger missing parts being made at SIZ 860. The result was amazing: the phoenix re-emerged from the ashes, as a fully functional cross-country staff car. " " On July 13, 2006 during a small ceremony, the vehicle was officially turned over to the museum in presence of the German military attaché, Lt. Col. Metz, the mayor of Diekirch, the museum volunteers and of course, the masters and some 40 apprentices of SIZ 860. The vehicle was jointly unveiled by a group of trainees and volunteers of the museum and an outdoor barbecue in honor of SIZ-860 was offered to all attendees."